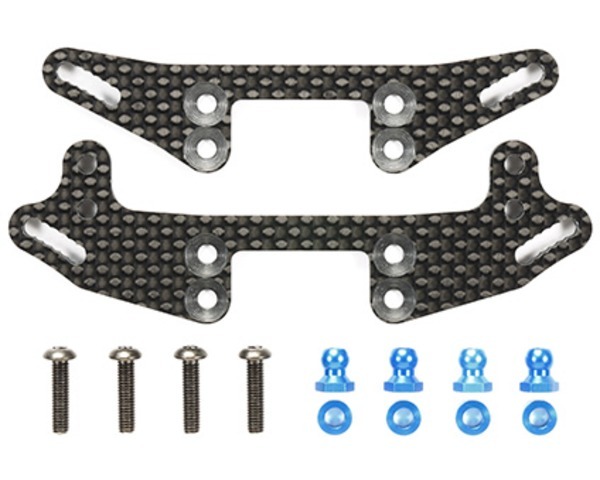 Fit your TA07 chassis with the super short big bore shock dampers from the TRF419X chassis! This set has F/R 3mm-thick carbon fiber shock damper stays with a lower shock attachment point. Use in conjunction with the Super Short Big Bore Shock dampers as they will give your TA-07 machine sharper steering response and a lower center of gravity. Screws, ball connector nuts and spacers included. Compatible with TA07 chassis cars using Super Short Big Bore Dampers (Item 42305).